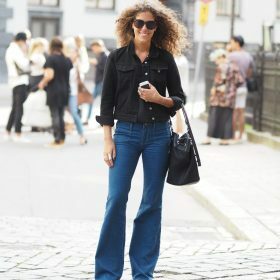 Trending: When to comes to bringing backs trends, I don’t think we’ve seen more success than with flared jeans for women. In your mind, you might think that bootcut jeans seem a little dated but once you’ve tried a modern-day version of flared jeans for women you’ll soon realise they are the most comfortable, figure flattering and trendy pair of jeans you’ve ever owned! Whether you want to highlight your waist by wearing jeans with a patterned cropped top or just want to look casual in a Fenty Puma sweater, you’ll never look back after buying your first pair of women’s bootcut or flared jeans.